I want to know if this is good. Well the thing is that I don't know or I haven't learned the alphabet completely so I was searching to make one that I understand, here I let you a photo of the alphabet in my notebook, under each word there is the way to pronunce it but I put it the sound of pronuntiation in spanish mostly and I want you to tell me if I am right or not to correct it.... Greetings and thanks. It's really good! The only things I'd say are that: 1) Й is pronounced like "yeh" (I couldn't really read what you wrote under that in brackets) and 2) you didn't include the soft and hard signs, though if you were only trying to write out the letters that are actually pronounced, then this comment is irrelevant. I think й is more like "yi/yee" then "yeh"
Fair enough. How would you transliterate "е" then? that's what I'd call "yeh"
It's quite difficult to Romanize it. If you want to compare the two, "yih" may be a more precise representation of "e" than "yeh" would be. Sorry if that's not quite as helpful/precise as you would like; maybe just listening to native Russian speakers talk would be more indicative than this. ^^"
It seems to be fine if you are a Spanish speaker. (х - j) ;D But please write Й, not inverted Ñ (I see a difference). 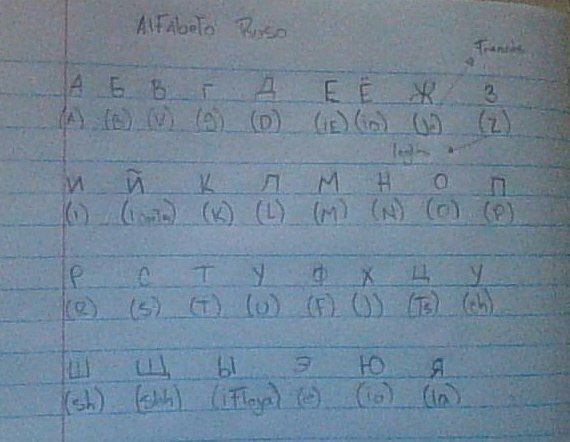 You will probably find this link useful: http://www.russianforeveryone.com/RufeA/Lessons/Introduction/Alphabet/Alphabet.htm it gives you some examples of how it would sound in English, and also has some audio of each letter. If I am learning Spanish is learning Russian a good idea?